Heat oil in a large frying pan; cook beef in batches until brown. Transfer to a plate. Using the same frying pan, saute onion and garlic until onion softens. Add paprika and mushroom until mushrooms are just tender. Return beef to the pan with juice. Bring to boil and reduce heat and let it simmer for 5 minutes. Add paste, sour cream and dill, cook until heated through. 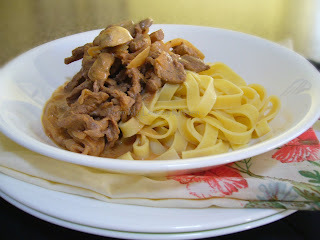 Serve with fettucine.